Today we have found you an airfare to a really unusual but not less charming destination, Azerbaijan. Book the Turkish Airlines flight featured in this post and fly from New York to Baku for $749 r/t with taxes. if you book for the dates we have found in December you can save over $40 compared to the next cheapest flight on this route. Though this Baku flight deal was provided by Flighthub, we have found it on Travelgrove, but that does not mean that you should not compare the prices of some other merchants also, in case they have this deal for less. Your flight will depart from John F. Kennedy International Airport (JFK) on January 22 2015 and will fly back from Heydar Aliyev International Airport (GYD) on January 29 2015. You will have one stop in Istanbul each way, first a 15 hour 5 minutes on and then a 7 hour 20 minutes one. You will gain 12,224 award miles from Turkish Airlines Miles and Smiles which is approximately 20% of a free Europe to US airline ticket. 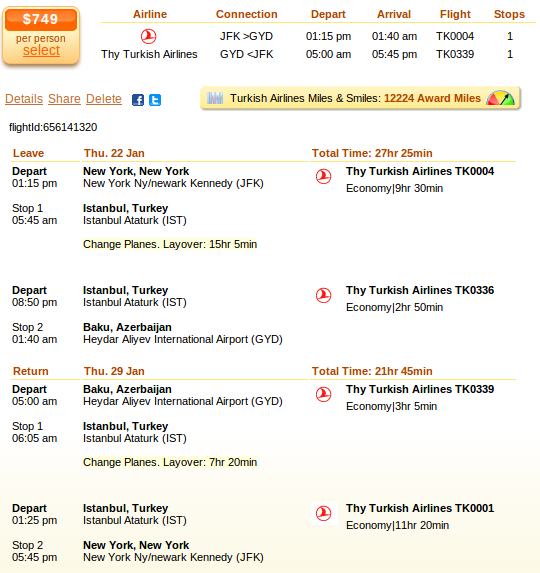 Book with Turkish Airlines and save $41 compared to Air France’s deal that costs $790 r/t. Other aifares cost even more, but you can see them in the table and look for them in the box above. This entry was posted on Thursday, October 16th, 2014 at 5:08 am and is filed under Airfare Deals. You can follow any responses to this entry through the RSS 2.0 feed. You can leave a response, or trackback from your own site.